3 cycles of R-ICE chemotherapy followed by a Stem Cell harvest, followed by BEAM Chemotherapy followed by Stem Cell Transplant. This task is so big it had to be handled by two hospitals and two full Oncology teams one based in Cork (where I live) Bon Secours and the second based in Dublin (167 miles away) St James. St James took the lead in all procedures. 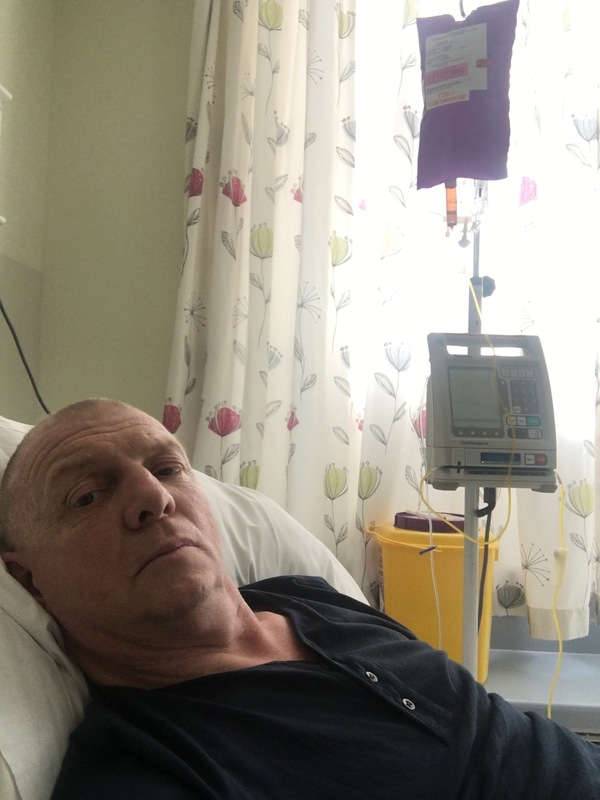 Admitted to hospital the day before chemo 9th April 2017 for blood test urine test etc. Got good to go ahead and commence Monday at 11am 10th April 2017. Had a PICC line surgically placed into my left arm (this is basically a long tube inserted into a vein that ends up close to your heart.) a discomforting procedure that takes about 40 minutes from start to finish. Then back to the room to commence. Firstly I got an anti nausea injection to cover 3 days. Then two small bags of steroids followed by a 3 hour infusion of Etoposide (the E in ICE) followed by 1 hour Carboplatin (the C in Ice) and that was it for day one. All was good, drank about 3 ltrs of water and slept well that night. I was aware what day 2 would bring. Due to the server level of Chemo the medical team had to tackle protecting my kidneys and my bladder (known side effect is server bladder damage) So I had 2 hours of Mensa followed by 24 hours of Ifosfamide (the I in Ice) and 24 hours of Mensa at the same time. To say I did not sleep that night means I stayed awake. So the 24 hours commenced at about 3pm Tuesday and ended at 3:30pm Wed – followed immeadiately by 2 hours of Etoposide. I then has infusions every 3 hours for 20 minutes a total of 9 hours. So Thursday 13th my doctors came to see me. They were more than happy with me. Apart from elevated blood sugar (Previous chemo resulted in becoming Type 2 insulin depended diabetic, cured myself of that in Oct 2015). Constipation that they felt was mild. But good to go home. PICC Line was removed as risk of infection too high. Lots of warning about blood sugar levels, temperature, high risk of infections, server constipation and a lot more. Before leaving the hospital my liaison cancer nurse came in and went through everything that was going to happen. And of course a multiple list of medication. And the planned next visit 1st of May 2017 for admission (18 days from last date) to commence Cycle 2 over 3 day from 2nd May. So finally released on Thursday 13th of April after Cycle 1. Got home and felt the old familiar feeling of fatigue. I had fatigue after ABVD and once you have experienced chemotherapy fatigue then you will know whats its like. But the fatigue from ICE is about 100 times worse. However I managed it, went to bed when I felt it coming got back up as it eased back. Then the injections of Neupogen GSF and yes it causes bone pains and lots of them, properly every bone in the body. Other side effects included Peripheral Neuropathy (sensation of numbness and tingling in hands and feet) this never fully went after ABVD but it did get more server for the week after ICE. Temperament was not good but could be controlled. Found it extremely difficult to sleep. But that was about it. I was capable of walking, driving and cooking. All my healing thoughts to you Ian. Keep writing, keep inspiring. Keep up ur strong spirit Ian .